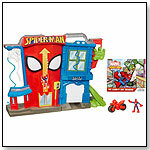 TDmonthly® - New Toys and Games: Spider-Man Stuntacular City Playset from HASBRO INC. This awesome Spider-Man Stunt City playset is the perfect home for the amazing wall-crawling hero. Kids' Spider-Man figure will do his most heroic stunts when he takes on his enemies in the Spider-Man Stunt City playset. Will he climb down the wall or spin down the pole? He can swing on his web line, slide down the lizard tail ramp or cling upside down to escape his enemies, and he can dodge their lunges and drive right through the door on his speedy motorcycle. Press the button for lights and sounds and cool Spider-Man phrases. When playtime is over, kids can read the special value storybook "The Lizard’s Lost Treasure." — As of 11/5/2012 this product had 3.9 out of 5 stars from Amazon.com. Pros: Spiderman can climb up the side;lots of different sections on the play set offer different types of play. Cons: A few users reported that the electronic functions in the toy stopped working shortly after purchase.